Fall is upon us! The pumpkins are ready to be carved, it’s time to go apple picking, and football is back! Most football fans, college or pro, know that the season is full of ups and downs when rooting for your team. You never know what the outcome of a game is going to be, but you can always count on Caputo’s to make sure everyone is well fed on game day! We offer the perfect foods for a game day party, tailgate, or for just lounging around and watching football all day! From guacamole to salsa to different dips to wraps, we’ve got all of your appetizers covered! We also have the perfect meals– wings, sandwiches, sausage, and more! Boneless and bone-in chicken wings. Plain, BBQ, teriyaki, or buffalo, the chicken wings are so juicy with the perfect amount of breading and sauce. 3ft American and Italian sub sandwiches. The American sub sandwich contains oven roasted turkey, polish ham, hard salami, and American cheese on a french baguette. 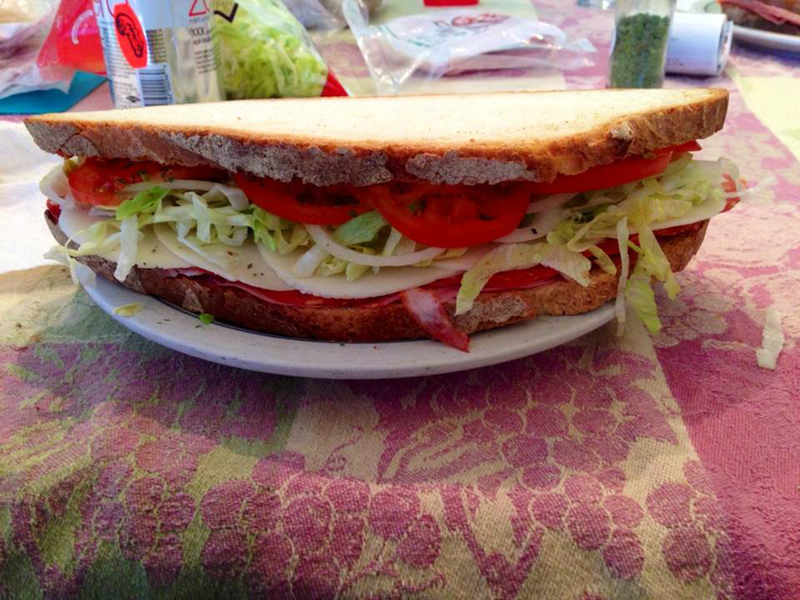 The italian sub sandwich contains Volpi genoa salami, mortadella, mild capicola, and provolone on a french baguette. Another tailgate staple is sausage. Our homemade sausage is handcrafted using old world and traditional recipes in our own facilities. 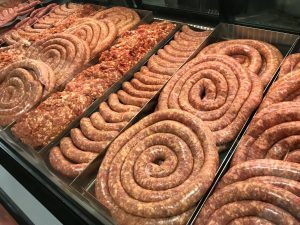 We carry a wide variety of sausage– rope, links, bulk, polish, barese, mild, and so much more! Our sausage is made with trimmed, lean pork and house blend of spices and seasonings. Every bite is even more delicious and juicy than the last. Our sausage topped with our homemade La Bella Romana giardiniera is the perfect combo. These items are sure to make any game day easy and relaxing while still eating good, quality meals. What’s evenbetter thandelicious food? Delicious food at a low price! This weekend we have you game day necessities on a 3 day sale! Check out this week’s ad to see the items featured in the sale! Check Out Caputo’s and Win! And that’s exactly what we’ve done. 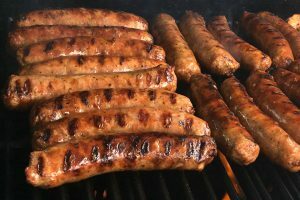 During the summer months, Caputo’s hosted a series of all-you-can-eat Parking Lot Picnics featuring grilled burgers, hot dogs, and our famous Italian sausage, plus sides, drinks, and desserts. 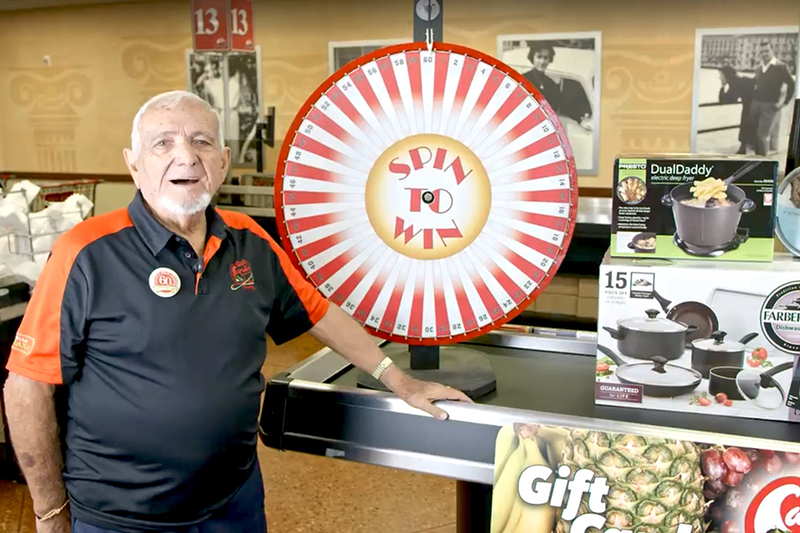 Now, as summer gives way to fall, each of our seven locations is hosting Check Out Caputo’s, an in-store game where the winning customers walk out with prizes in addition to their groceries. Here’s how it works: Each store location will host Check Out Caputo’s for one day from 11:00 AM until 3:00 PM. 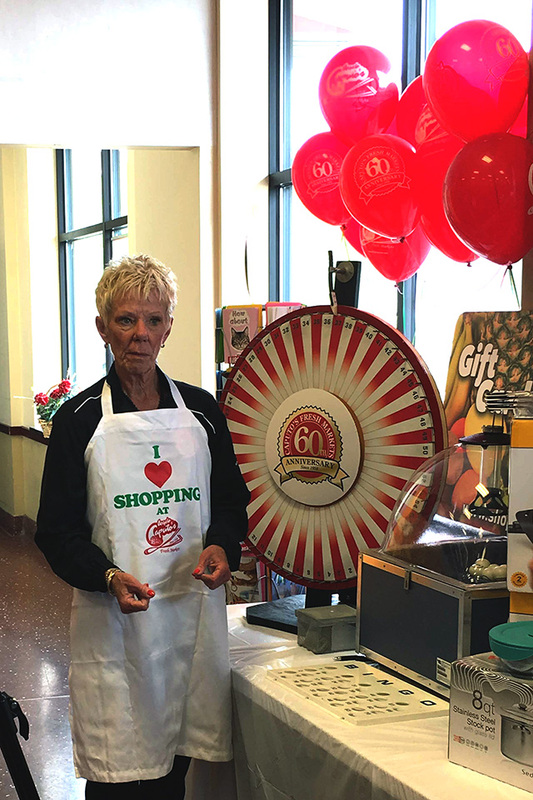 On the day of the event, our prize team will be set up at the front of the store with a bingo ball machine, a prize wheel and a table filled with prizes. Every 15 minutes, the prize team will be drawing a numbered ball to determine the “winning” checkout lane. All customers in the “winning” lane will be given a card that allows them to play the game over at the prize station after they finish checking out. Each card holder will receive a $5 Caputo’s gift card and be allowed to spin the wheel for a chance to win some great prizes. 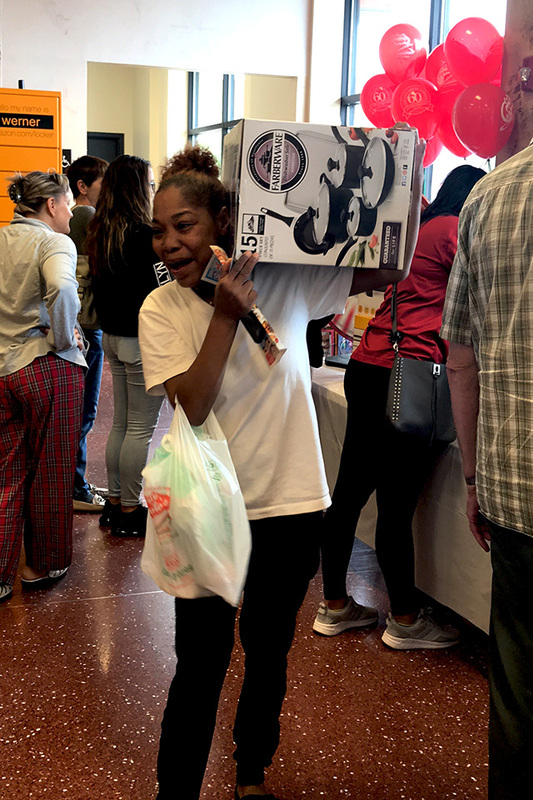 The first game event was held on Saturday, September 8 at our Elmwood Park market. Greeters were handing out complimentary shopping list pads to all customers as they entered the store. 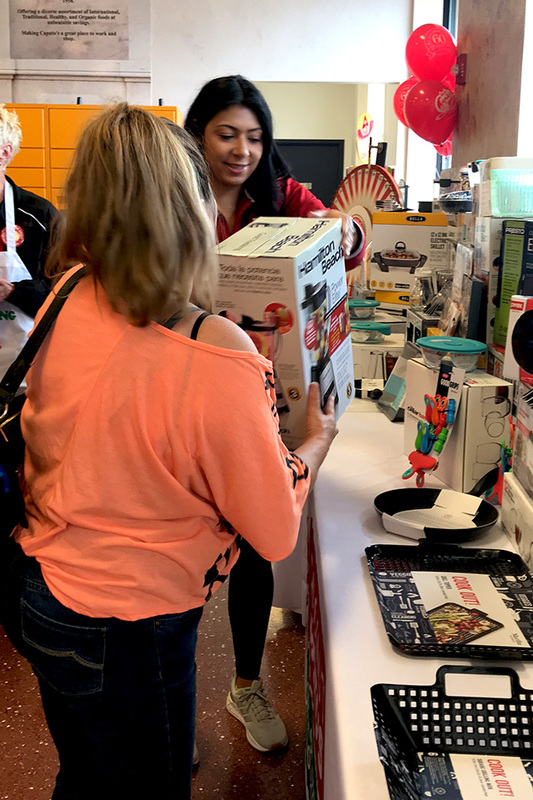 Winning customers were allowed to select their own prizes, which ranged from gadgets to small appliances. There were many smiles and even a few squeals of delight as the game continued. Several members of the Angelo Caputo family were on hand to greet the winners and personally thank them for being customers. Occasionally an individual would walk up to the prize station and ask what they needed to do in order to play. 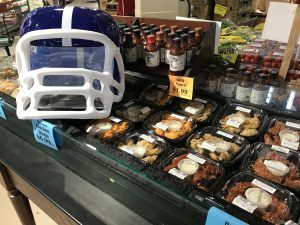 Nobody knows in advance which lane number will be pulled, so winning is simply a matter of shopping at Caputo’s while the game is being played and being in the right place at the right time. The Check Out Caputo’s game will be hosted for one day at each of the remaining store locations during the months of September and October. Here is the current schedule. We hope to see you there! Eating fresh cantaloupe during the growing season is a joy unto itself, especially if you know how to pick a good one. Here’s how to consistently ensure that the cantaloupes you select are ripe, sweet, and flavorful. Appearance matters. This may seem obvious but always select cantaloupes that look good. Avoid obviously defective or damaged fruit. This includes any melon with a cracked rind, soft spots, bruises, or moldy patches. Steer clear of stems. 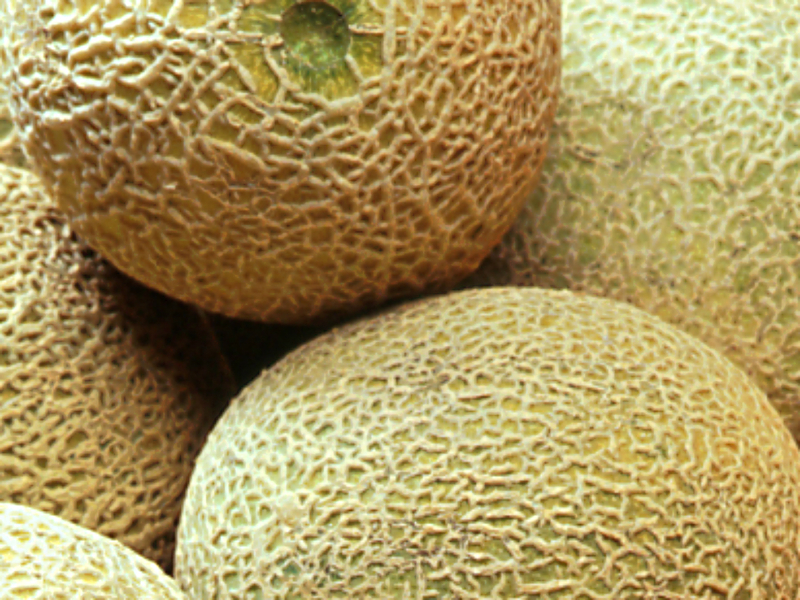 Melons easily detach from their stems when ripe. If you see a cantaloupe with a piece of stem still attached or with a torn rind where the stem was attached, that means it was taken from the vine too soon. And since they do not continue to ripen after being picked, a cantaloupe with its stem still attached should not be selected. Go for the gold. The rind of a ripe cantaloupe should have a gold or orange tint with well-developed netting. 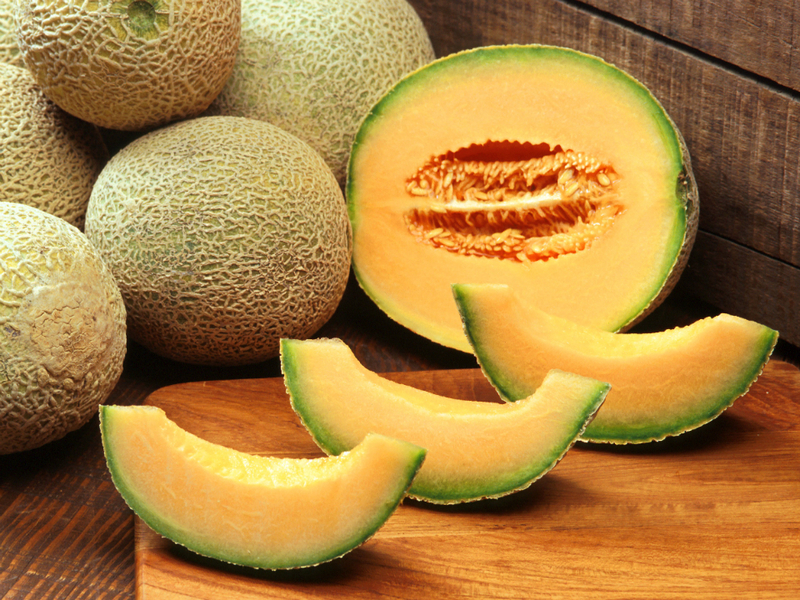 If you see a lot of dark green and the net-like textured part appears to be rather thin, the cantaloupe is not ripe. Also examine the spot that shows where the melon was resting on the ground. A smooth, yellow patch means you’ve got a ripe melon. Lightweights need not apply. When comparing cantaloupes, pick them up. A good cantaloupe contains a fair amount of water and will thus feel heavy for its size. All other things being equal, go with the heavier fruit. How does it feel? A healthy, ripe cantaloupe is neither rock-hard nor soft and squishy. The melon should be uniformly firm. There should be a slight indentation where the stem used to be, indicating that the melon came off the stem easily and that indentation should not be wet. The blossom end, which is opposite the stem end, should give slightly when pressed. Smell the blossom end. A sweet, ripe cantaloupe smells pleasantly sweet, especially at the blossom end. A cantaloupe that has no sweet aroma should not be considered. In addition to being delicious, cantaloupe is quite healthy. 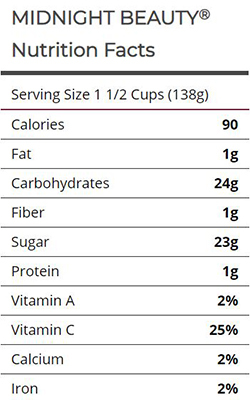 Thanks to the high water content, one cup only contains about 55 calories. 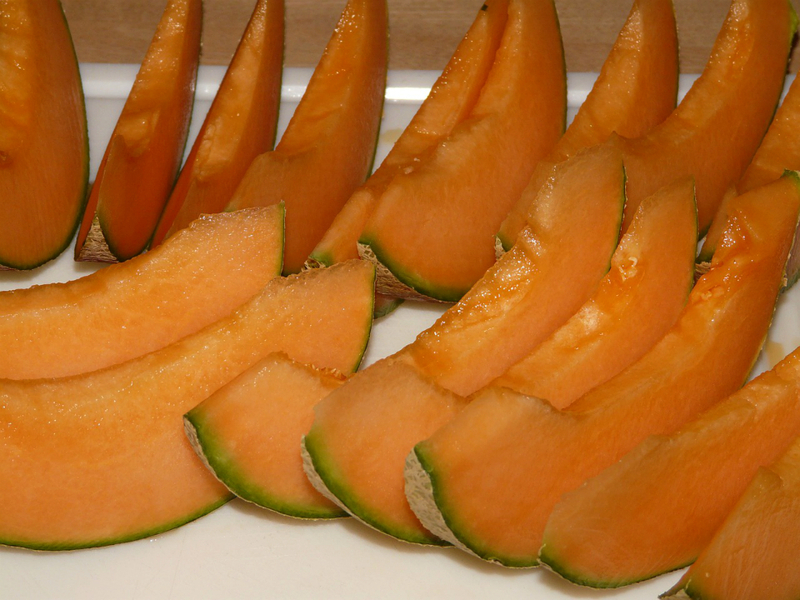 Cantaloupe is a great source of vitamins A and C, potassium, beta-carotene, and fiber. 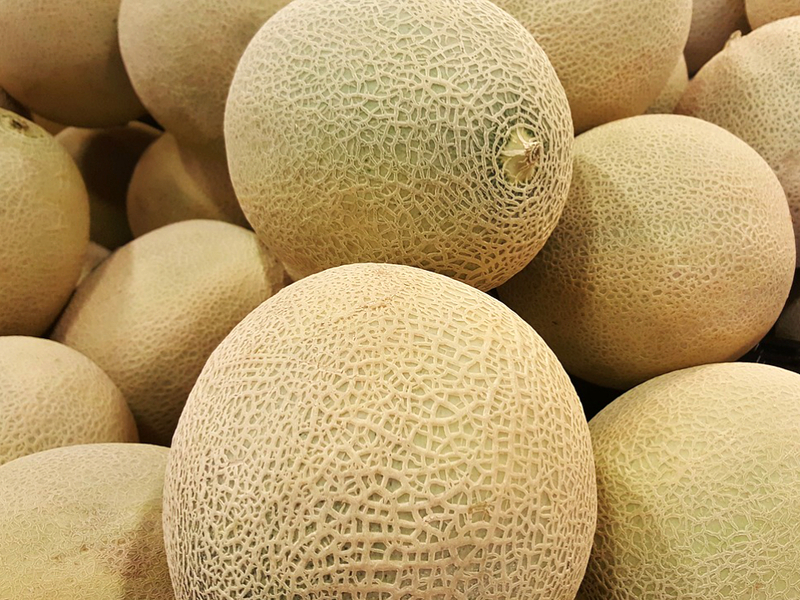 Now that you know what to look for, stop by any of Angelo Caputo’s Fresh Markets‘ seven store locations and get some delicious cantaloupe today! 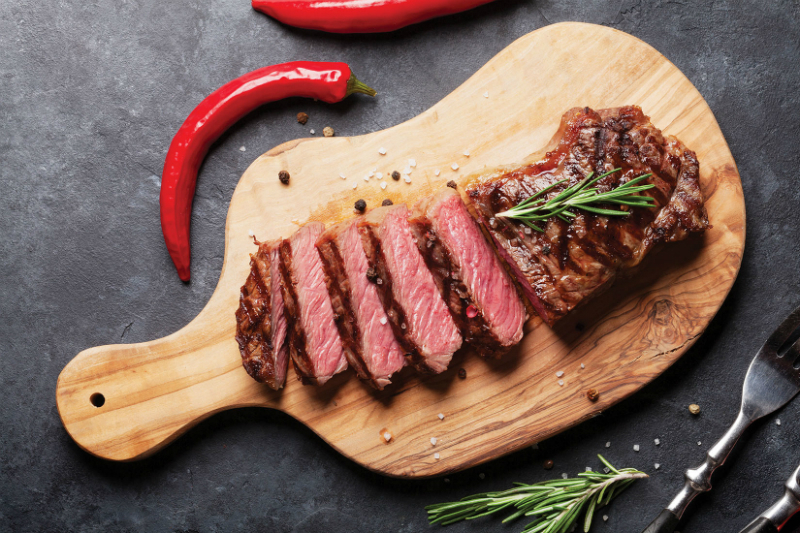 At Angelo Caputo’s Fresh Markets, we sell a wide variety of quality fresh meats that are intended to suit the wants and needs of many different consumers. 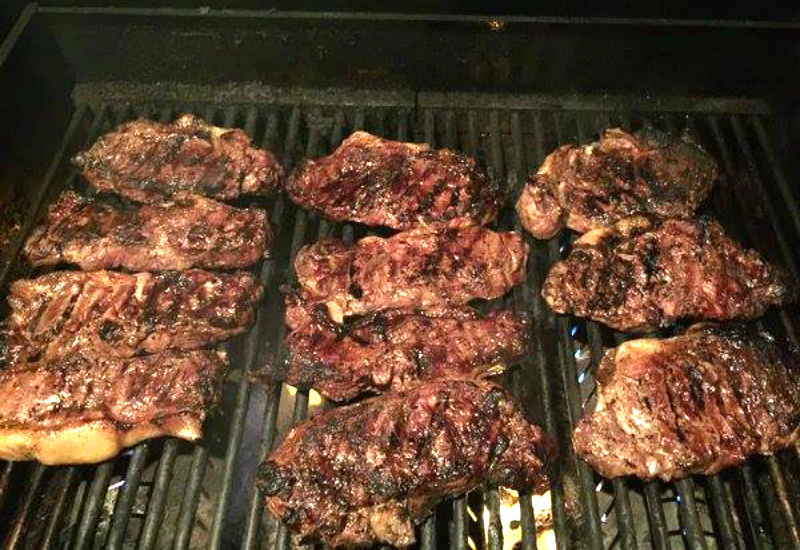 This includes a line of 100% grass-fed beef from Thousand Hills Cattle Company in Minnesota. 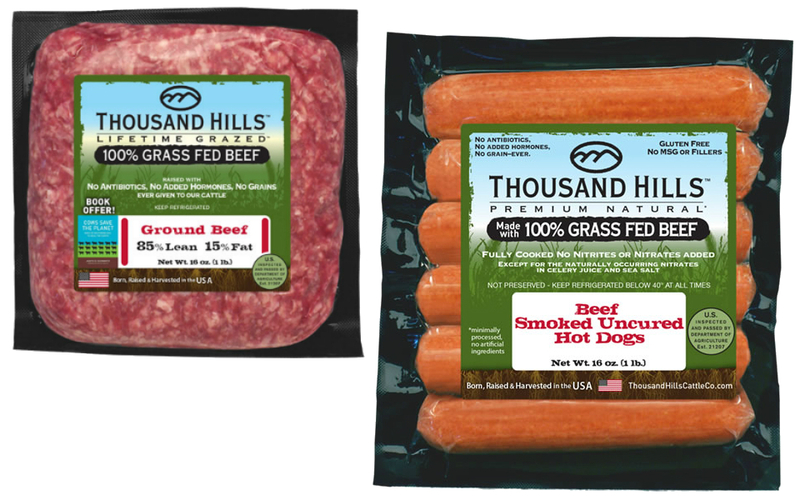 Now celebrating their 15th year in business, Thousand Hills describes their products as “Beef with Benefits” and also coined the phrase “Lifetime Grazed” which indicates the animals only eat grass for their entire lifetime. 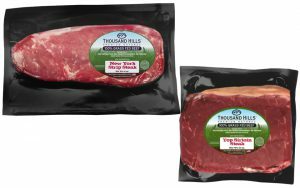 According to the folks at Thousand Hills, there is an important point of distinction to be made between truly grass-fed beef and what is allowed to be labeled “grass-fed” beef. As we have seen happen with labeling for many foods, “grass-fed” has become as much a marketing term—a justification for charging higher prices—as an accurate description of what’s really in the package. Consider that under some circumstances, cattle could be pasture-fed for a period of time and then sent to a feedlot to be “finished” on grain, where they will quickly and cost-effectively reach a hefty slaughter size and weight, and the beef produced could still be labeled grass-fed, as long as the producer obtains the proper approval for labeling it as such. This happens all the time. So if you want the benefits of eating truly grass-fed beef, it pays to ensure that’s what you’re buying. 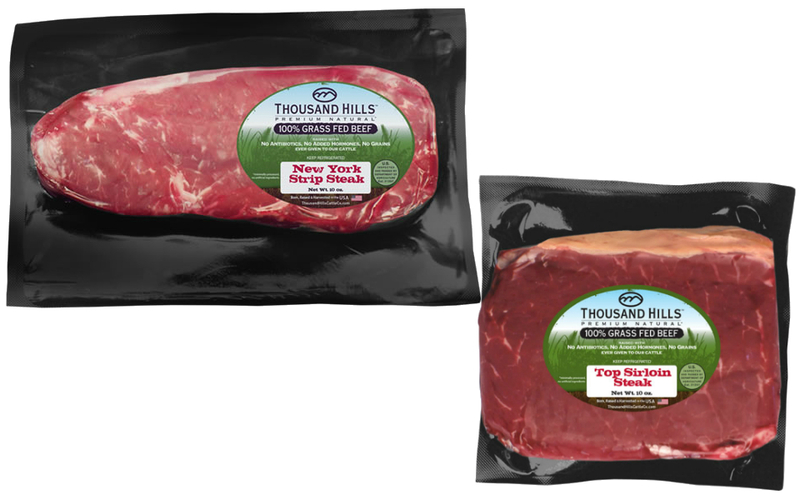 Look for beef labeled 100% grass-fed. What’s the difference? Our friends at Thousand Hills wish more people would ask that question. It turns out that what the cattle eat can and does affect what we eat when we consume the beef. For example, grass-fed beef contains a much healthier ratio of omega-6 to omega-3 fatty acids than does grain-fed beef. Grass-fed beef also contains much more Conjugated Linoleic Acid (CLA) which is said to help fight cancer and promote weight loss. In simple terms, cows that eat what cows were meant to eat are healthier than cows whose feed is designed to make them larger and heavier. Then there are the environmental benefits. 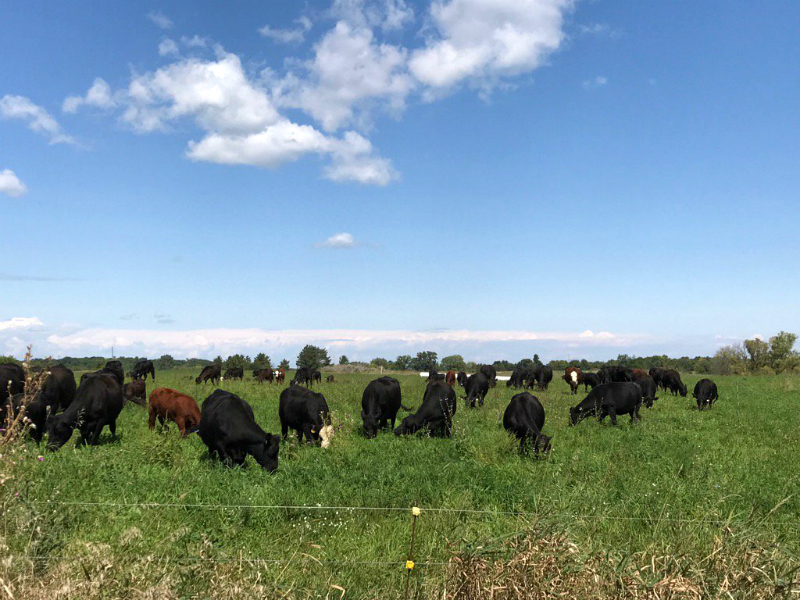 The cattle farms utilized by Thousand Hills utilize a practice called rotational grazing, which is the intentional and planned movement of livestock to different “rested” sections of pasture in order to maximize the quality and quantity of forage growth. Rotational grazing on multiple pasture areas enhances bio-diversity on the land and helps build topsoil. Increased topsoil is good for the land and also for the environment at large by increasing carbon sequestration (the capture and long-term storage of carbon dioxide from our atmosphere). Through rotational grazing, the cattle feed on a variety of healthy grasses. 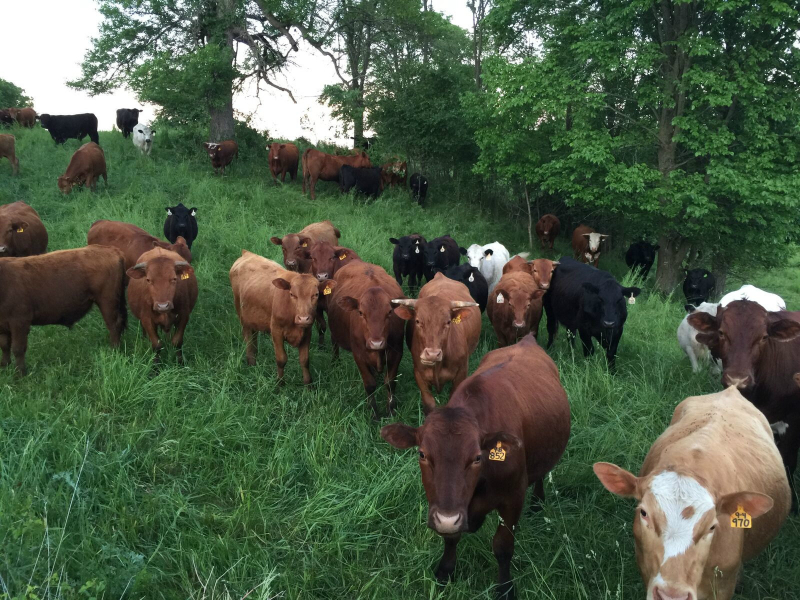 Healthier pastures make better food for the cattle, which in the long run means better beef for the consumer. Speaking of human consumption, 100% grass-fed beef tastes the way beef is supposed to taste—the way beef tasted before grain feeding became the conventional way to raise beef for more profit. 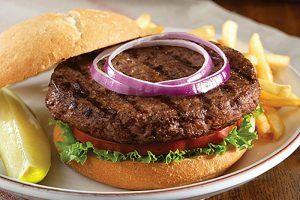 Lifetime grass-fed beef is far leaner with a more natural beef taste—and the fat that’s there is healthier fat, as we’ve already discussed. Keto/Paleo diets encourage eating 100% grass-fed products (beef, milk, cheese, butter) because their fat profile is healthier for us. 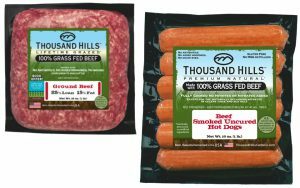 Does 100% grass-fed beef cost more to produce? Yes. Grass-fed cattle take much longer to reach their slaughter weight. They cost more to feed and because they live up to a year longer than conventional feedlot cattle, their care and upkeep also cost more. On top of all that, in the end, grass-fed cattle weigh less, so each animal yields fewer pounds of beef. All of this translates to a higher cost at the register, but such is the cost of a more humanely raised, healthier, more environmentally friendly food source. For all of these reasons, Angelo Caputo’s Fresh Markets carries products from Thousand Hills Cattle Farms at each of our seven locations. If you are looking for quality, 100% grass-fed beef, we think you will be pleased. Please stop in and pick up some today! Grapes have been around for a very long time. In fact, the intentional growing of grapes began 6,000–8,000 years ago in what is now considered the Middle East. 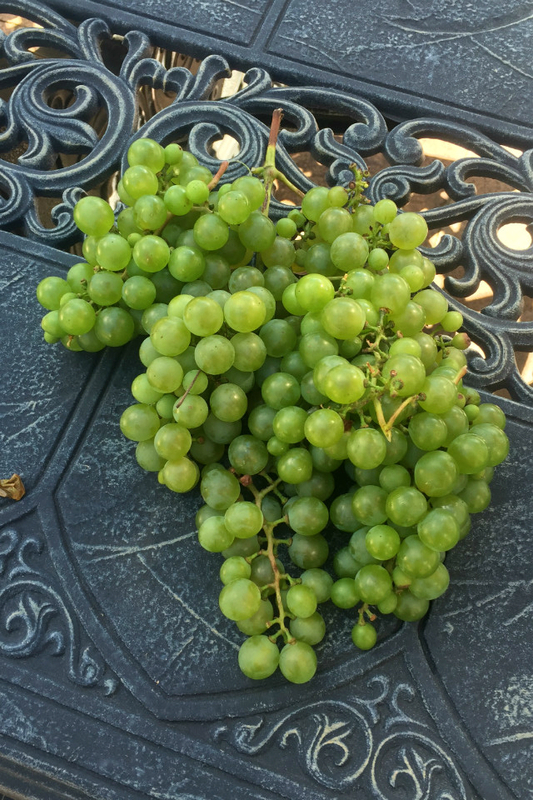 Many grapes are developed and used for wine production—a practice that is also thousands of years old—while other varieties, generally referred to as “table grapes” have been selectively bred to be consumed raw and used in recipes. Table grapes tend to be larger in size and have somewhat thinner skins. Many are seedless. Angelo Caputo’s Fresh Markets always carries a variety of fresh table grapes at each of our seven locations. Right now we have an excellent variety of black seedless grape called Midnight Beauty® from our friends at Sun World, a quality grower in California. They describe their Midnight Beauty® brand grape as large, crisp and bursting with sweet flavor. As grapes go, this really is an attractive fruit. But don’t let that sweet flavor fool you. A cup and a half of these delicious grapes packs only 90 calories, in addition to healthy antioxidant plant substances like polyphenols, resveratrol, and flavonoids. Grapes are also a good source of vitamin C, potassium, and fiber. 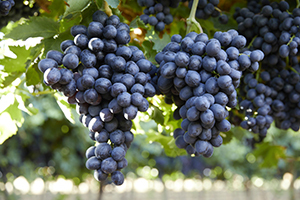 When selecting grapes, look for clusters of firm, plump fruit with full color. Wet, shriveled or moldy berries should be avoided, but grapes covered with “bloom” are perfectly fine. Bloom is a naturally occurring white substance that coats the outside of the grapes, protecting them from moisture loss and decay. It’s safe to eat, but can easily be removed during washing by rubbing them with a bit of baking soda or salt. Then rinse the grapes under cool, running water for at least 30 seconds. Speaking of washing, it’s best to store grapes unwashed in their original container and then wash them before consuming. Always check for grapes that are broken or show signs of decay—before. during, and after storage—and remove them at once. Midnight Beauty® black seedless grapes can be eaten fresh or used in a variety of recipes. Have you ever made a fruit pizza? The folks at Sun World created this how-to video, which we thought you might enjoy. Midnight Beauty® black seedless grapes from Sun World are generally available from June through September, so get yours while they last! It can be somewhat entertaining to watch the unfamiliar trying to spell or pronounce the word giardiniera. Fortunately, it’s easier to say than to spell. Don’t look at the spelling of the word, just say it, nice and easy: jar-din-AIR-ah. Some Chicagoans will drop that last syllable, saying something more like jar-din-AIR. It’s the same thing and it’s delicious. This is the go-to condiment for Chicagoland lovers of Italian beef, Italian sausage, and meatball sandwiches, to say nothing of Italian submarine sandwiches, pizza and more. Loosely translated the word means “from the garden” in Italian. You will find giardiniera in stores all over Italy, but it won’t be the same thing you find here. According to a Chicago Tribune article, what they call giardiniera consists of larger chunks of pickled vegetables, usually packed in vinegar and better suited to serving on a platter than on a sandwich. The Chicago variety, by comparison, is intended to be used as a condiment or relish. And while the veggies are indeed pickled, they are most often packed in oil. What kind of veggies? The recipe can vary greatly from one brand to another, but frequently includes hot and/or mild peppers, celery, carrots, pitted green olives, and other vegetables (cauliflower, pimento, etc.) mixed with a spice blend and covered in a stable salad oil. Most hot versions include sliced or chopped “sport” peppers, a variety of small, medium-hot chiles that are often found whole on a Chicago-style hot dog—but that’s a story for another time. Most times when we order an Italian beef sandwich with “hot peppers,” at least around here, the sandwich is served with hot giardiniera. 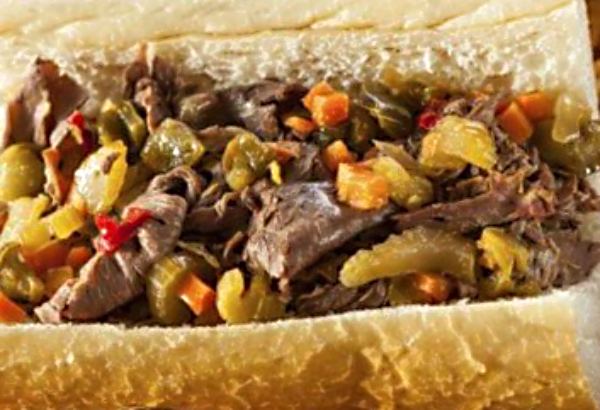 Here’s a quick tip: If you are applying hot giardiniera to your own sandwich, you can somewhat control the heat by regulating how much oil you allow to go on your food. The oil captures the oil-like compound capsaicin from the hot peppers. You want a little more heat? Let the oil go on your sandwich along with the veggies. Less heat? Let the oil run off before putting the veggies on your food. It’s all relative, though. Don’t expect miracles. Outside of Chicagoland, you might not find many choices of giardiniera from which to choose. We don’t have that dilemma here. Quite the opposite, in fact,. As evidence we invite you to step into the giardiniera aisle at any of our Angelo Caputo’s Fresh Markets locations. There you will find an array of brands and varieties broad enough to satisfy any giardiniera lover’s appetite and quite possibly overwhelm the faint of heart. We’ll make it easy for you, though. 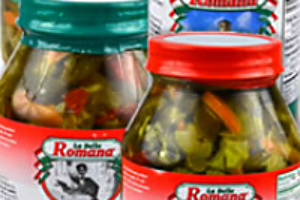 Try our very own La Bella Romana brand of hot or mild giardiniera. Packed exclusively for us and available only from Angelo Caputo’s Fresh Markets, our giardiniera is very flavorful and also provides a crunchier texture than do many other shelf brands, which tend to be a little soft from processing. Whether you’re new to giardiniera or a seasoned pro, give La Bella Romana a try. We think you’ll be pleasantly surprised. 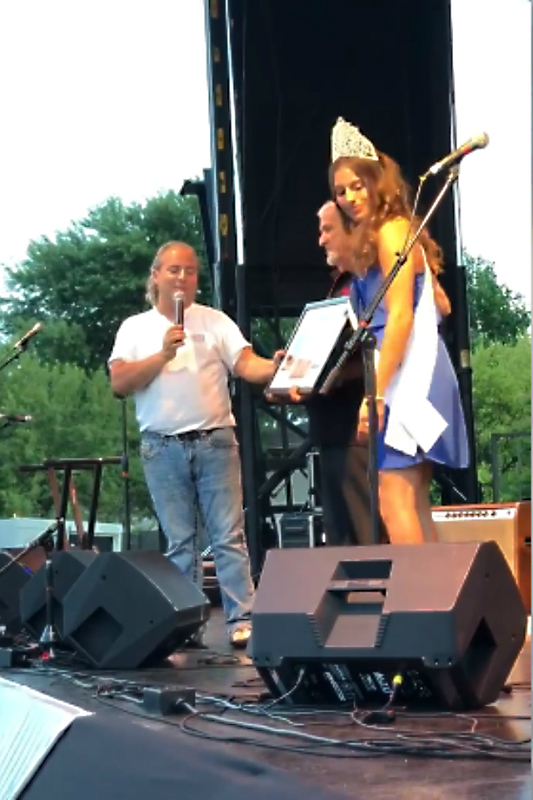 Local entrepreneur and promoter Ron Onesti took some time out of his often-manic schedule last Saturday to recognize our own Angelo Caputo at Onesti’s Little Italy Fest-West in Addison, a four-day festival devoted to Chicagoland’s Italian-American culture and heritage. After bringing Angelo and his family up on stage, Ron presented the festival’s first-ever Neighborhood Pioneer Award in recognition of Angelo Caputo’s Fresh Markets‘ 60th year in business. “When you define family business, this is definitely the epitome of family business,” Onesti proclaimed to the crowd gathered around the entertainment stage. “You walk into corporate headquarters, you’re greeted by granddaughters and grandsons, sons-in-law and it’s just a great family thing. 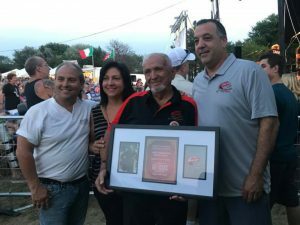 It’s the essence of being Italian.” An assistant brought out the award, which Ron then presented to Angelo and his family amid cheers from the audience. 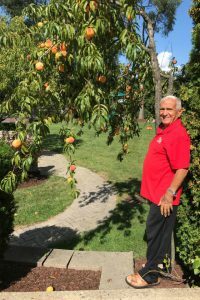 Ron Onesti has a long record as a staunch supporter of keeping the Italian-American culture strong. Born on Taylor Street in Chicago’s Little Italy, he has spent many years supporting and representing numerous Italian-American causes and organizations. Through his company, Onesti Entertainment Corporation, Ron has personally established multiple Italian-American festivals across the Chicago area. 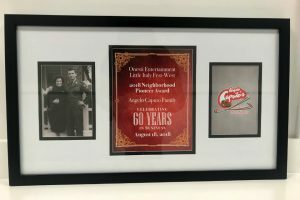 The award is now on display at Caputo’s corporate headquarters, where a number of Angelo’s family members work, just as Ron had described Saturday. 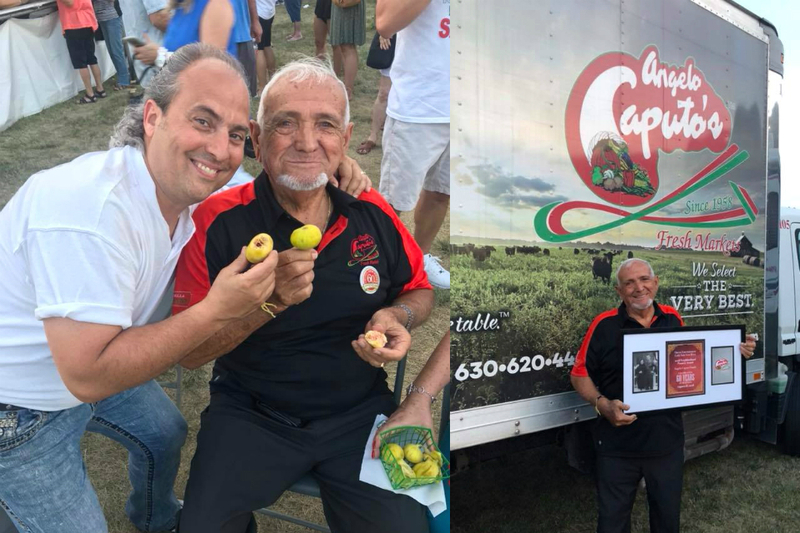 Since Angelo’s retirement from full-time work, his daughter Antonella and son-in-law Robertino oversee the company, assisted by their sons and daughters in various capacities. 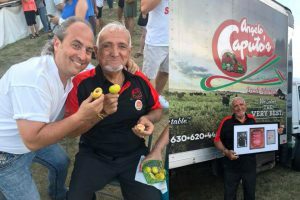 As large as it has grown, Angelo Caputo’s Fresh Markets very much continues to be a family business and we, along with many others, gladly do not see that changing anytime soon. 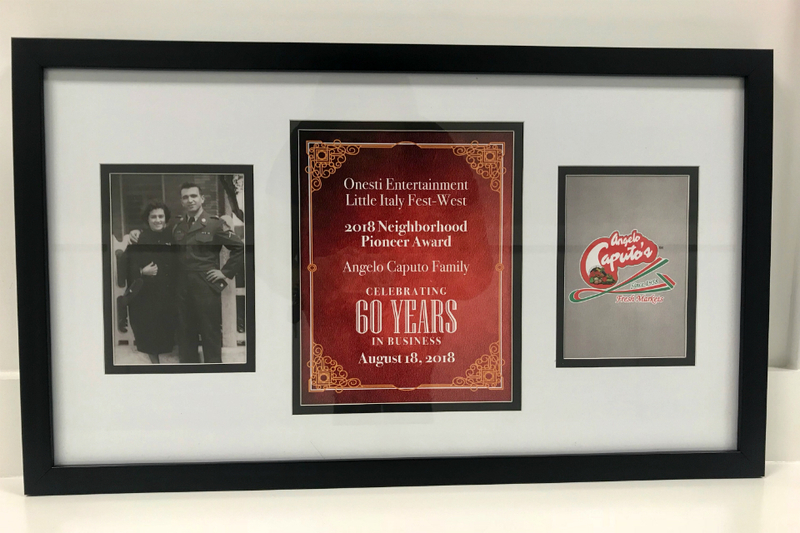 The Angelo Caputo Family is grateful to Ron Onesti and his organization for this very special gesture of recognition. 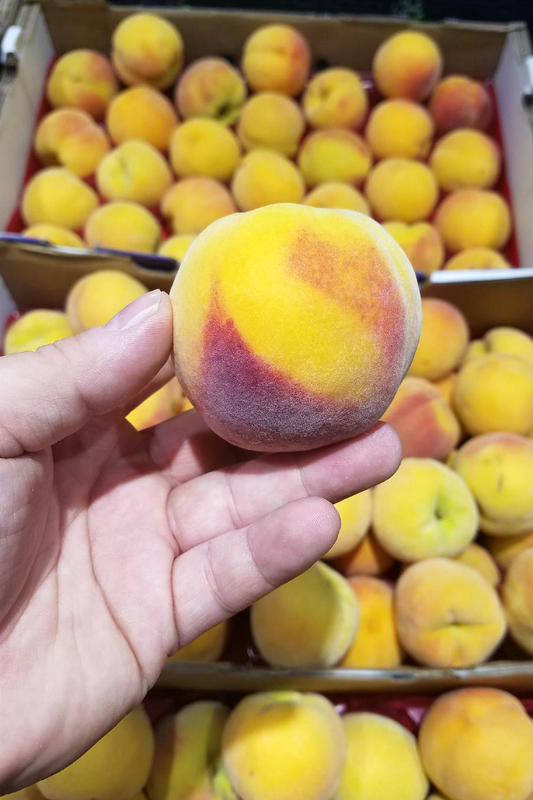 As we continue to enjoy the summer season here in Chicagoland, it’s time to talk about the annual arrival of a delightful summer fruit grown exclusively for Angelo Caputo’s Fresh Markets by an Italian family farm in California. 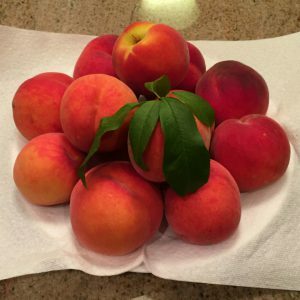 Percoca peaches are an Italian specialty variety of clingstone peach prized for their flavor and aroma. Like most cling peaches, the Percoca’s flavor and consistency make it ideal for canning, processing, and cooking but are also quite delicious when eaten fresh. 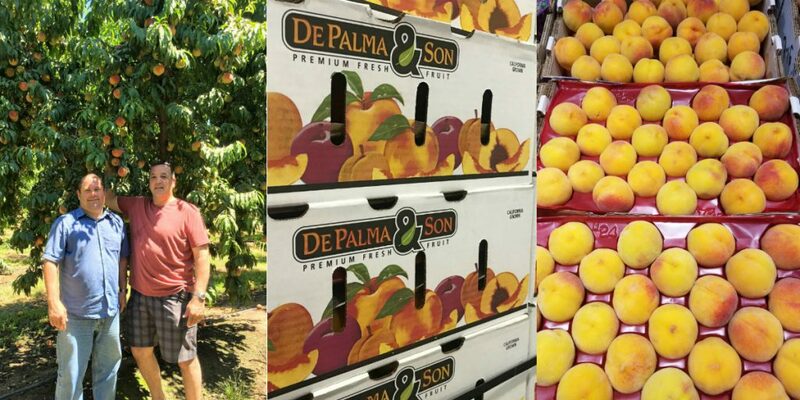 For over 30 years, we have been doing business with the family-owned DePalma Farms, who grows Percoca peaches exclusively for Angelo Caputo’s Fresh Markets. 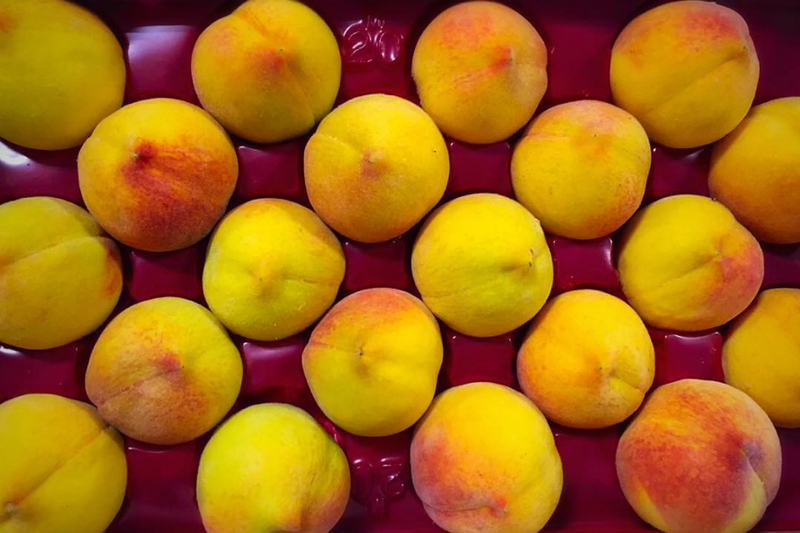 These peaches have a flavorful yellow flesh which can be enjoyed in many ways, after removing the stone. 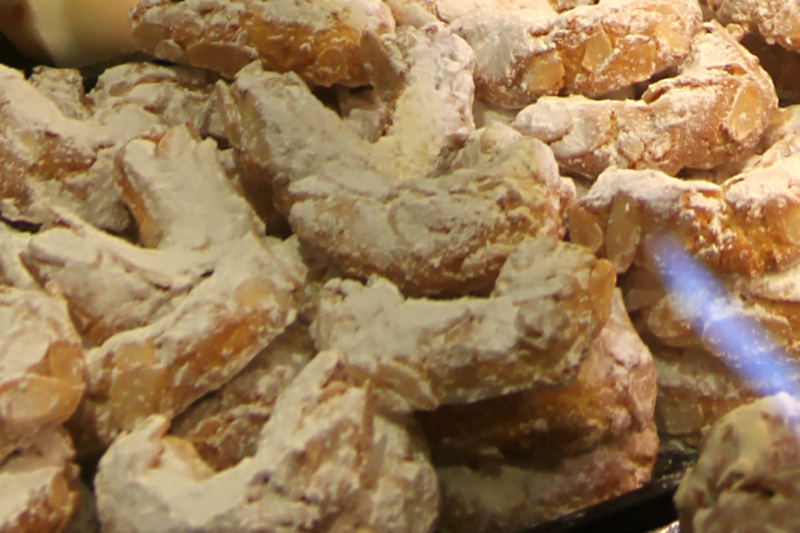 One such way, popular in many parts of Italy, is to place chunks or slices of Percoca peaches into a container and cover them with white or red wine. After allowing this combination to mingle and chill for a while, it is customary to sip the wine and eat the wine-drenched peaches. There are entire festivals in Italy dedicated to this simple yet delicious treat. Our Percoca peaches are only available for a limited time each year. Please stop in soon to get yours! Imagine sitting outside on a pleasant mid-summer evening, enjoying a handful of fresh strawberries, cherries, or grapes. Or slicing fresh peaches into a small pitcher and then pouring your favorite wine over the freshly cut fruit. Bite-size pieces of fresh cantaloupe wrapped in prosciutto? This is a magical time of year at Angelo Caputo’s Fresh Markets, especially for lovers of fresh-picked fruit. Locally grown fruits and vegetables are in full swing now and we are at family farms in Michigan, Illinois, and Indiana to pick up fresh produce daily. These are the same family farms with which the Angelo Caputo Family has been dealing for decades. Because we buy directly from local family farmers and then sell the fresh produce to our customers, visiting any of our stores is like going to a farmers’ market, only without paying the premium prices! Of course, our love of locally grown produce goes back a lot farther than that. 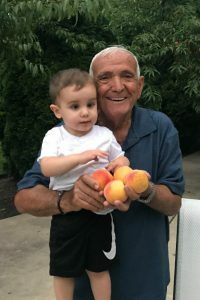 When Angelo Caputo was growing up in Mola Di Bari, Italy, his family had a 25-acre farm site where they grew almond trees, olive trees, peaches trees, and St. John’s Bread (carob), as well as many different fresh vegetables. 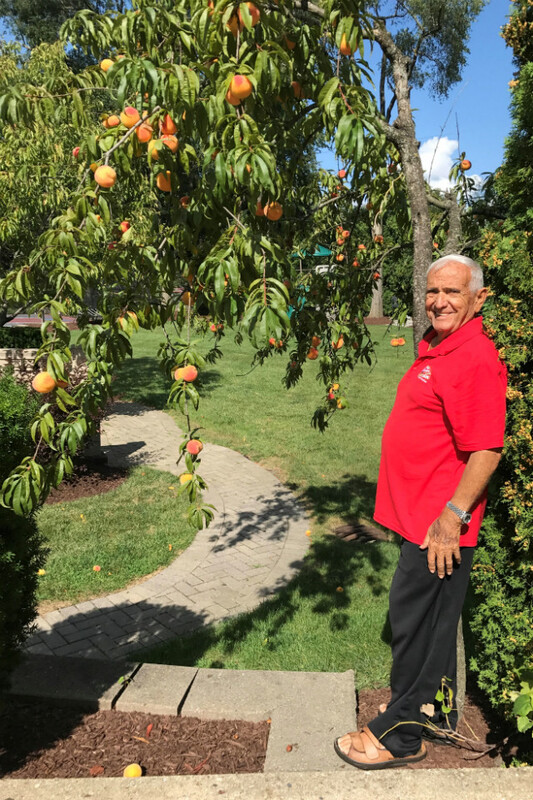 If you were to see Angelo’s backyard today, you would find peach trees, cherry trees, and fig trees, along with many fresh herbs. This family learned many years ago that there is nothing quite like the experience of eating freshly picked summer produce. But you don’t have to take our word for it. Stop by today and see for yourself! So much of traditional Italian family life seems to revolve around the family table. Meals are more than just opportunities to take sustenance. They are family gatherings, opportunities to share news, knowledge, emotions and more. These gatherings—and the food served there—have long been an integral part of the Italian family experience. The more momentous the gathering, the more interesting the food one might expect to see. This is not to say that the coffee and biscotti put out for family visitors on a Sunday afternoon won’t be great, but food offerings are often tailored to fit the occasion, from an ordinary weekday meal to a major holiday feast. 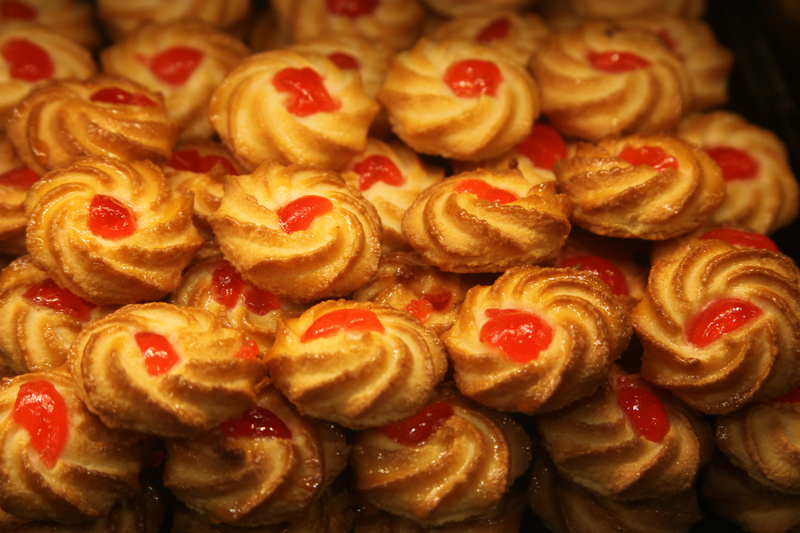 Desserts also tend to become more memorable for bigger occasions. After all the other courses have been consumed, as the coffee comes out, so do the sweets. And just when you think you couldn’t eat another bite, those tempting sights and aromas convince you otherwise. 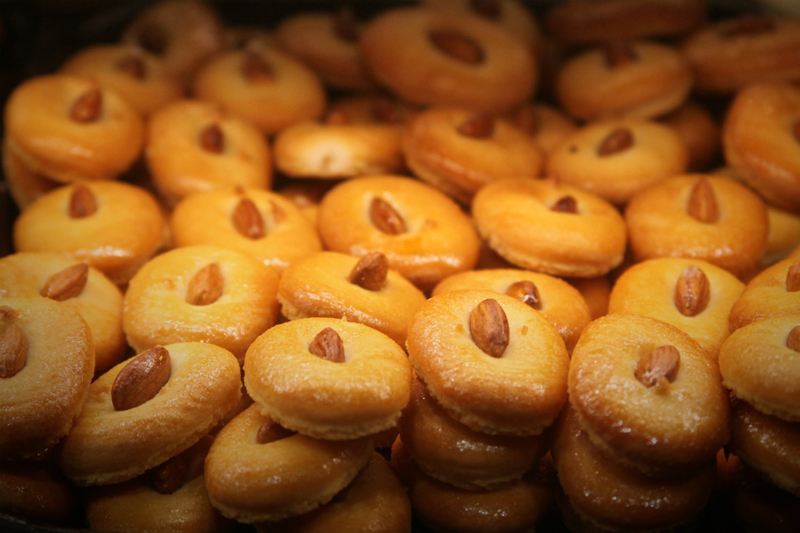 Romana Caputo was known for her amaretti, delicious Italian almond cookies that come in several shapes and varieties. Straight from the oven, they have a crisp exterior and a chewy inside that becomes crunchy over time. For any significant family event—baptisms, first communions, special occasions, holidays, etc.—Nonna Romana would make her amaretti, which everybody looked forward to eating. Were Romana’s cookies that good? Over the years, many friends and family members would come to her, asking her to help them make cookies for their special occasions. 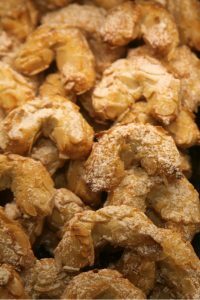 Romana Caputo did in fact help them, sometimes making hundreds of pounds of cookies in her small home kitchen. 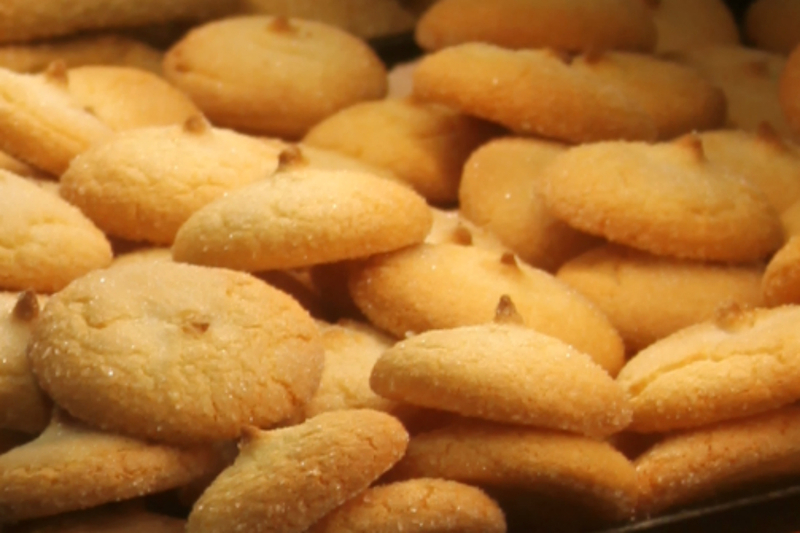 The amaretti—along with biscotti and fig, lemon, and chocolate spice cookies, to name a few—that we bake from scratch and sell under the La Bella Romana label at Angelo Caputo’s Fresh Markets are still the same cookies that Romana Caputo used to prepare with so much love and pride. That’s why we do not hesitate to put her name on them. Please try some and see for yourself. Angelo Caputo’s Fresh Markets is committed to operate with pride and passion the Freshest. . . Friendliest . . . Cleanest.. and Healthiest stores in Chicagoland. We have always strived to exceed our customers’ and our employees’ expectations since 1958 and we are committed to continue doing so into the future. We offer a diverse assortment of International, Traditional, Healthy, and Organic foods. However, we do not believe that full variety, fresh food, and friendly service should cost you more. 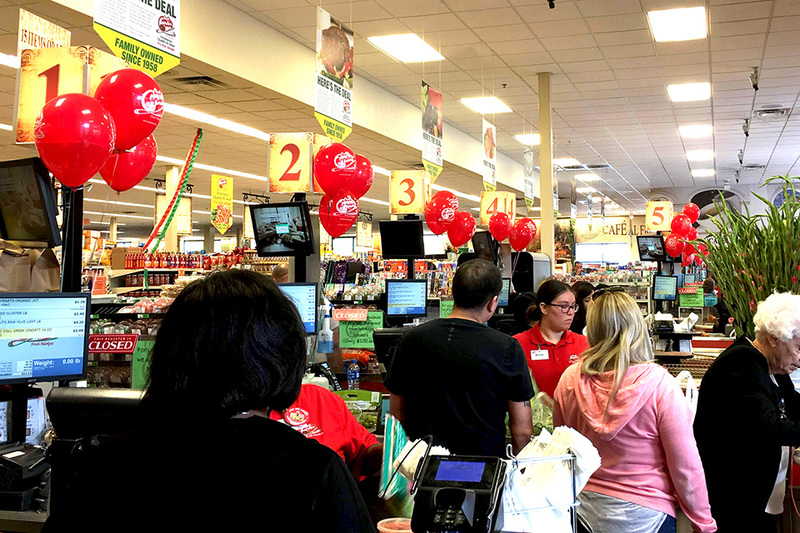 Therefore, you can count on Angelo Caputo’s Fresh Markets to offer you great savings on your grocery needs every day of the year. 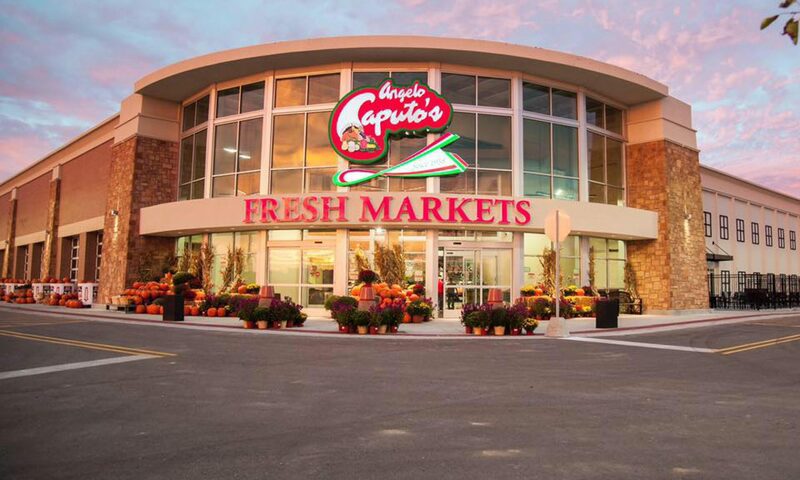 Simply stated, we want to assure you that Angelo Caputo’s Fresh markets is a great place to work and shop. Return to ShopCaputos.com home page.